An American led multinational force comprising 35,000 troops from several countries was pressed into service. But more assistance was needed and an international appeal was sent out for other countries to join. In December 1992, India decided to join the United Nation sponsored international effort “Operation RESTORE HOPE”. 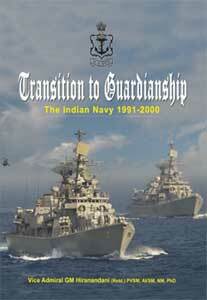 India’s contribution was a brigade of about 2000 troops and a naval task group of three ships. Consequent to the Cabinet Committee on Parliamentary Affairs deciding in favour of participating in the humanitarian efforts, a task force comprising three ships was dispatched to Somalia. 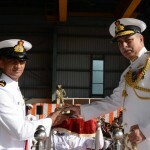 IN Ships Deepak, Kuthar and Cheetah constituted the task group and was commanded by Commodore Sampath Pillai who was designated as Commodore Indian Naval Forces (COMINF). An Indian Liaison Organisation (INLO) was set up with LtCdr Hari Kumar as the first INLO, at the Coalition Joint Task Force (CGTF) HQ located in the US Embassy building to liaise with UNITAF, UNOSOM and NGOs. The team consisted of one officer, three MARCOs and few others. The liaison officer represented the Indian forces at all meetings, intelligence briefings and functions at the CGTF HQ and was the nodal point for liaison between the liaison cells set up by 22 countries. Search and Rescue by Sukanya. On 03 February 1993, INLO was approached by representatives of World Food Programme (WFP) and CARE to intercept a CARE chartered ship MV Remorra Bay which was carrying 350 tons of sugar and 15 tons of wheat flour. The ship had lost radio contact since 28 January 1993 off the coast of Merka. It was a practice of the Masters to unload the aid material at enormous profit at other ports (like Brava, Merca) and blame it on attack in the high seas by pirates. INS Sukanya sailed with representatives of WFP and CARE to intercept the merchant vessel. At 1715 hrs, MV Remorra Bay was sighted and a Gemini was lowered with an armed boarding party. By then, the merchant vessel had resolved the engine problem that was due to fuel contamination. Assistance for Humanitarian Aid. UNICEF sought IN assistance for the transportation of humanitarian aid between Mogadishu, Kismayo and from Mombasa. These stores, till then were airlifted and it was found uneconomical. INS Sukanya made two trips to Mombasa (10–20 Feb & 03–11 Mar). In addition, cargo was also carried for the Irish agency CONCERN and for UNOSOM. The IN participation in the UNITAF ‘Op RESTORE HOPE’ was restricted to patrolling and transporting of UN Stores. The UNITAF operations were terminated on 04 May 1993 (17 December 1992 to 04 May 1993). However, the humanitarian assistance in Somalia continued as United Nations Operation Somalia (UNOSOM). When UNITAF was handed over to UNOSOM II, the IN was requested for officers to assist the new HQ till permanent staff arrived. This was readily acquiesced and LtCdr NNS Manian, LCdr KK Pandey and LCdr Hari Kumar were assigned to the Transition Headquarters in March 1993. It was the first time in the history of the IN that naval officers wore the Blue Beret and worked on an UN mission. The naval representation from ashore was withdrawn in June 1993 and the IN ships were withdrawn by end 1993. The performance of the Navy and the troops deployed for ‘Operation MUFFET’ made a conspicuous geopolitical impact. 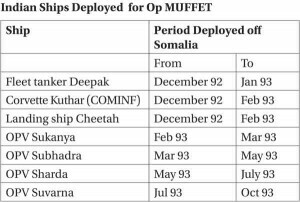 ‘Operation SHIELD’ (06 to 11 December 1994) was the name given to de-induction of troops from Kismayo and ‘ Operation BOLSTER’ (12 to 23 December 1994) concerned the de-induction of troops from Mogadishu. By the middle of 1994, the Brigade in Somalia, had completed its tenure of duty, and needed to be de-inducted. De-induction of UN forces and their equipment required offshore and air support, but this was not readily forthcoming. India therefore chartered merchant ships and an airliner. The Navy deployed two frigates and a tanker for the de-induction operation. Each frigate had two Seaking heavy helicopters. The mission was assigned to the Western Fleet in the middle of November 1994, and the Western Fleet Commander was designated Task Force Commander. Ganga and Godavari sailed from Mumbai on 28 November and Shakti departed 26 November 1994, headed for Kismayo. Cover the de-induction of 1 BIHAR Battalion Group from Kismayo. Provide helicopter support for the evacuation of the rearguard elements. Provide air-surveillance and close weapon support during withdrawal of armour from airport to seaport and their loading on merchant ships. Provide hospital ship facility on board Godavari. The Battalion Commander of 1 BIHAR handed over the airport to the City Council and the troops guarding the airport, regrouped, and moved cross-country to the seaport. Phases of De-induction from Kismayo. By 06 December 1994, the 1 BIHAR Battalion, deployed in Kismayo for the UN controlled humanitarian and relief operations, had withdrawn from the town area and had concentrated in three areas namely Kismayo International Airport, Marolles Complex and Kismayo Seaport. The progressive de-induction of the troops began by their airlift to Mogadishu. Equipment packed in containers, along with armour and vehicles were also withdrawn to the seaport. Phase I — Deinduction from Airport. The first phase commenced on 07 December 1994 with two L-100 aircraft arriving from Mogadishu for de-induction of the bulk of troops. The Battalion Commander of 1 BIHAR handed over the airport to the City Council and the troops guarding the airport, regrouped, and moved cross-country to the seaport. The Naval ships provided NGS while helicopters provided air surveillance and close weapon support all along the route for the withdrawing men and armour. The show of airpower with four armed helicopters providing route cover prevented the Somali militia from closing on the withdrawing troops. While the operation was in progress, two merchant vessels, namely, MV Free Wave and MV Vinnitsa arrived at Kismayo and anchored close to the IN ships. Phase II — Deinduction from Marolles Complex. 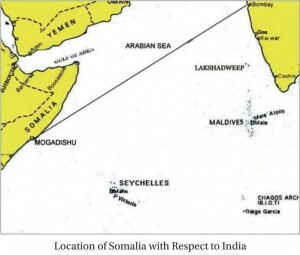 The Marolles complex, a facility under the control of Indian troops, was to be handed over to the Somalis. Situated at the northern end of the causeway between the mainland and the seaport, the complex was planned for vacation followed by a quick retreat of troops and armour to the Hamburger Hill/Seaport. 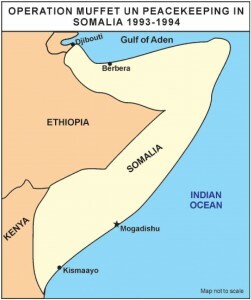 As the operation got underway, a large number of armed Somalis converged at the checkpoint of the complex. To prevent any misadventure, all four naval helicopters were airborne and positioned to cover the approaches. Soon after, the Battalion Cdr handed over the Marolles Complex to the representative of the City Council, the armour and troops withdrew to the Hamburger Hill. However, as expected, no sooner had the complex been vacated, the locals broke into the area and looted the place.